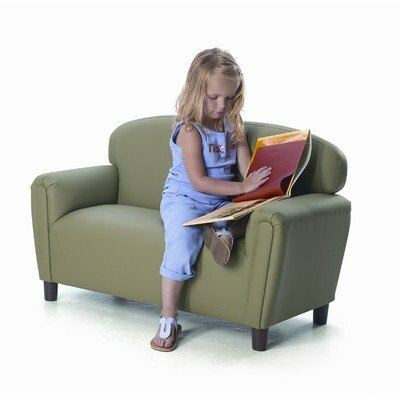 Preschool Enviro-Child Upholstery Sofa - Sage: Enviro-Child Upholstery offers a healthier upholstery alternative that is as durable and easy to clean as vinyl. Made of polyurethane, it is PVC-free. Our "just like home" furniture units are built with sturdy hardwood frames and comfortable dense foam. Designed with durability, quality and comfort in mind. Assembled in the USA by craftsmen who take pride in building furniture by hand. All Brand New World furniture units meet the safety guidelines set by the CPSC, ASTM, CPSIA and CCPSA. Our preschool furniture is built for the "rough and tumble" years of early childhood, yet provides " the look and feel" of home. The 3.5" legs make the seat height a comfortable 12". The sofa measures 38"L x 18"D x 24"H. Ages 3-6 years. One year warranty. Free of flame retardants. Enviro-Child Upholstery offers early childhood classrooms an eco-friendly and healthier upholstery alternative that is as durable and easy to clean as vinyl. Constructed with a sturdy hardwood frame and comfortable dense foam. Assembled in the USA. One year warranty. Free of flame retardants. Ages 3-6 years. Sofa dimensions are 38"L x 18"D x 24"H. Seat height is 12". Legs: 3.5". Weighs 34 lbs. Color: Sage. Easy to clean with either a mild detergent; an alcohol-based; or a mild bleach and water solution. Thoroughly rinse and dry. If you have any questions about this product by Brand New World Furniture, contact us by completing and submitting the form below. If you are looking for a specif part number, please include it with your message.